The cars keep showing up. Dozens of them are parked one after the other, facing the street in a long procession of two rows. 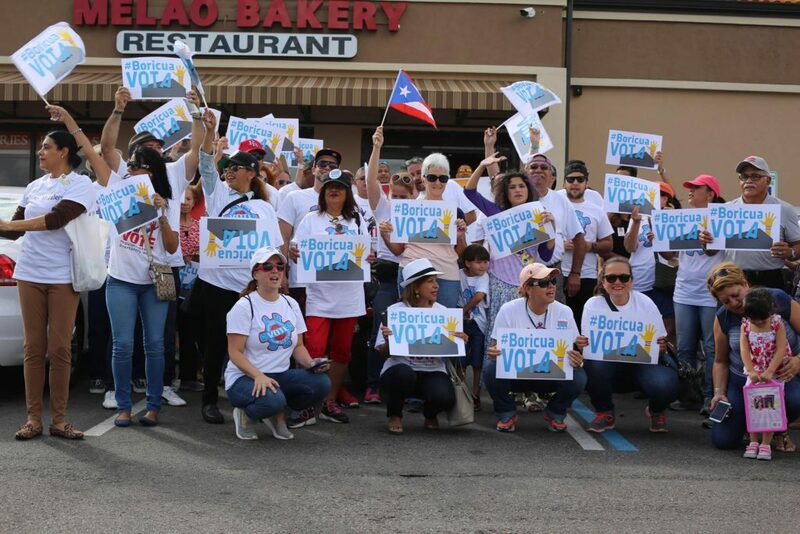 It’s early on a Saturday afternoon in mid-October and Que Vote Mi Gente, a newly formed coalition of local organizations, is preparing to lead its first official caravana through the neighborhood of Hunter’s Creek, which sits between Orlando and Kissimmee, Florida. When it’s almost time to leave, Jimmy Torres, President of Iniciativa Acción Puertorriqueña (Puerto Rican Action Initiative), gathers the group into a circle. Remember to follow traffic rules, he says, stop at red lights if need be. In Puerto Rico, this wouldn’t be an issue. Caravanas – or caravans – are a traditional part of political campaigns on the island. Though in this case, there is no candidate. Que Vote Mi Gente is only looking to make some noise (both in a literal and figurative sense) and encourage Puerto Rican voters to register and vote. Back in 2012, there were around 800,000 Puerto Ricans living in the state. 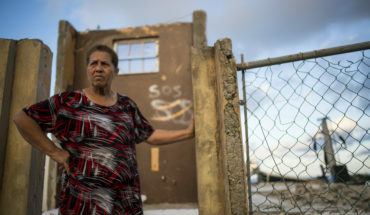 With the worsening debt crisis and mass exodus from the island, that number has surpassed 1 million, with an estimated 400,000 living in the Orlando area. Which is the why the I-4 corridor, which runs through central Florida, has become crucial to winning this swing state and with it, the presidential election. The procession of cars exits the parking lot, honking their horns and waving flags as onlookers take notice. The route lasts for a couple of hours. Christina Hernández and Frederick Vélez, two of the main organizers, think the event goes well enough. Some changes will have to be made, but next week’s caravana will be bigger, including a large bus to be added to the fleet and more importantly, loudspeakers to play music. Vélez and Hernández first met in 2012 at Casa Obama, the Tampa headquarters of the Obama reelection campaign. Christina was the Hispanic Vote Director and Frederick helped with the last six weeks of the election. The first thing she asked when Frederick showed up was if he could speak Spanish. It was an obvious, yet urgent question since Hernández didn’t have any Spanish-speakers on staff besides herself. When Vélez, a native of Puerto Rico, replied ‘yes,’ there was an immediate sense of relief and a partnership was formed. Four years later, Hernández is working with the community-based nonprofit Organize Now in Orlando and getting ready to launch Que Vote Mi Gente. It’s a concept she had pitched as far back as the Obama campaign in 2012. 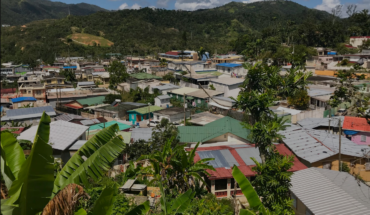 But that doesn’t mean there aren’t significant obstacles to accomplishing these goals such as voter apathy toward Puerto Rican and mainland politics, and modest resources. 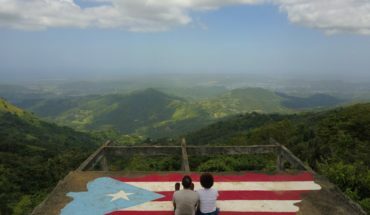 The added voting power would normally be an incentive, but many Puerto Rican voters are leaving behind a political situation that has exhausted their otherwise steadfast participation in elections on the island. Hernández has nearly a decade of experience working in politics, much of it in Hispanic outreach. She worked for the Clinton campaign in 2008 and then for the Obama campaign in 2012. Originally from California, she has spent most of her life in Florida. Her background is half-Puerto Rican and half-Panamanian, or as she playfully describes it: tengo la derecha de Cotto y la izquierda de Durán, a reference to two legendary prize fighters. Vélez spent the past five years working in Washington D.C. for Congressman José E. Serrano, while studying for his M.A. in Politics and Government from Johns Hopkins University. Back at the main office in Orlando, a shared space between several local organizations, Christina breaks down Que Vote Mi Gente’s Puerto Rican-centric, yet Latinx inclusive, branding strategy. The group’s logo was inspired by the Taíno sun, an indigenous symbol of Puerto Rico. “It’s a break from the traditional check mark in a box for the V for vote,” she adds. Yet the symbol also looks like a gear, a nod to the relentless work being done to organize the Latinx community. The name of the organization is taken from a line in the song, “Mi Gente”, a classic salsa hit by “El Rey de la Fania” Héctor Lavoe. It’s a catchy, simple play on words. Hernández took things one step further and rewrote the lyrics of “Mi Gente” into a voting anthem. She then approached Fania Records to acquire the rights. Earlier in the week, Hernández found herself in a recording studio in New Jersey singing backup vocals and producing a record with Grammy-nominated artist Frankie Negrón. A few days later Christina received an email with the final version, adding “executive producer” to her résumé. 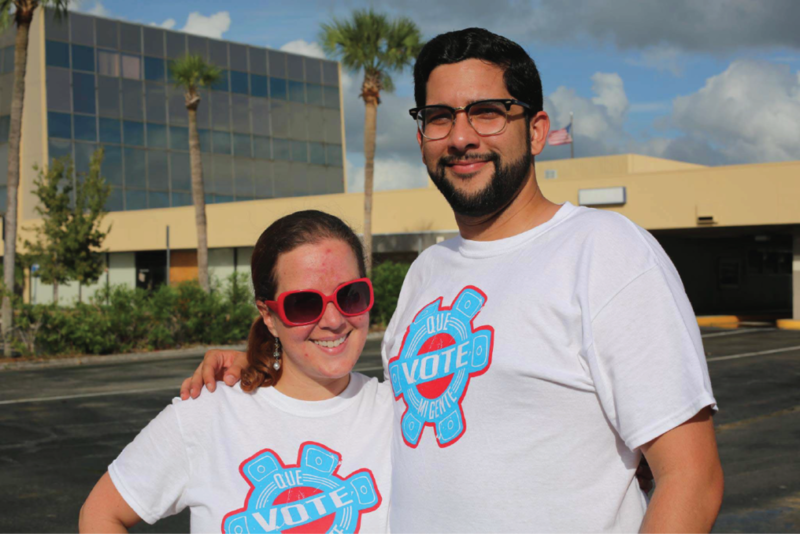 Much of Que Vote Mi Gente’s efforts have centered on mail-in ballots, giving voters the opportunity to study up on the candidates and avoid long lines on Election Day. The day before the caravana, canvassers set up in front of the Unidos Supermarket in Kissimmee. “In the first three weeks we registered over 3,000 people to vote by mail,” says Vélez. Que Vote Mi Gente also hosts political forums with local candidates and cafecitos, informal gatherings where coffee is served and politics are discussed. Two days before the caravana, Que Vote Mi Gente celebrates the opening of its office in Kissimmee with music, food, and dancing. As Frederick is addresses the crowd of organizers, families, and friends, suddenly a group of pleneros bursts into the room. La Plena is a traditional Afro-Puerto Rican style of music that features hand drums and singing. Vélez’s voice is quickly drowned out by the playful interruption and the crowd begins to sing along. These kinds of get-togethers are typical, seemingly more festive than political. Those in attendance are encouraged to fill out cards in English and Spanish expressing why it’s important to vote. Once paired with the hashtag #QueVoteMiGente, the photos show up on social media and the group’s website. For many, including those recently arrived from Puerto Rico, storytelling is a key element in Que Vote Mi Gente’s digital campaign. It helps members of the community connect to one another and feel less alone in adjusting to their new lives. The diaspora is seen as increasingly important in representing the interests of Puerto Ricans on the island as well. Past efforts this year have included two diaspora summits (one in New York City and the other in Holyoke, MA), the approval of a National Puerto Rican Agenda, and various social media awareness campaigns such as Stand Up For Puerto Rico. For all the attention to detail, Que Vote Mi Gente’s mission is simple: to let people be heard, in whichever language they prefer, within a context that feels safe. It’s a necessary step toward involving those who are uninterested or feel ignorant about the electoral process. Néstor David Pastor is a writer, musician, journalist, and translator born and raised in Queens, NY. He currently works with the Center for Puerto Rican Studies and was Managing Editor of the Unidos App. He attended Binghamton University.